Within the setting of 14K white gold earrings lies a pearl so pink, perfect and so fascinating that it remains by your side for an eternity for ever more. 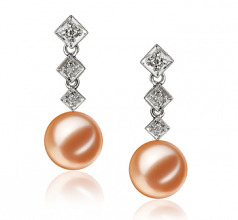 The Pink Freshwater Pearl and 14K White Gold Earring Set wows and sets the competition on edge. The ladies in the room stop to stare and attempt to figure out a way to emulate your style and fashion. They can’t and won’t. 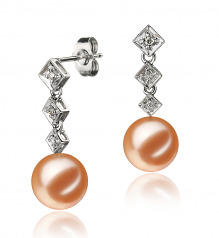 The earrings begin their decent with a set of three 3-D diamond shaped charms that feature a shimmering diamond accent for a combined total of 6 diamonds (.09ct). Show only for "Rozene Earring Set"